that picture is about seven different kinds of adorable. 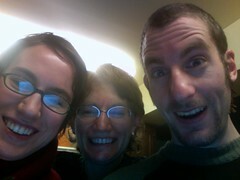 We're obviously taking the picture with Alex's laptop, the screen of which is dorkily reflected off my mom's and my glasses. I'm basically the 26-year-old version of my mom. Alex looks astonished to be in this situation at all. We barely fit in the frame. We're all grinning like this is the greatest thing that has ever happened.